+ (1 point) – the self-protection system successfully blocked the attack. +/– (0.5 points) – the product does not include complete self-protection from the specific type of attack, but retains (or automatically restores) the main functionality. – (0 points) – the product lacks self-protection from a specific type of attack; its main functionality has been disabled. Download GIF image (500х500px) The Platinum Self-Protection Award was awarded if an antivirus product's self-protection successfully blocked over 98% of attacks. Download GIF image (500х500px) The Gold Self-Protection Award was awarded if an antivirus product's self-protection successfully blocked over 80% of attacks. Download GIF image (500х500px) The Silver Self-Protection Award was awarded if an antivirus product's self-protection successfully blocked 60 to 80% of attacks. Download GIF image (500х500px) The Bronze Self-Protection Award was awarded if an antivirus product's self-protection successfully blocked 40 to 60% of attacks. 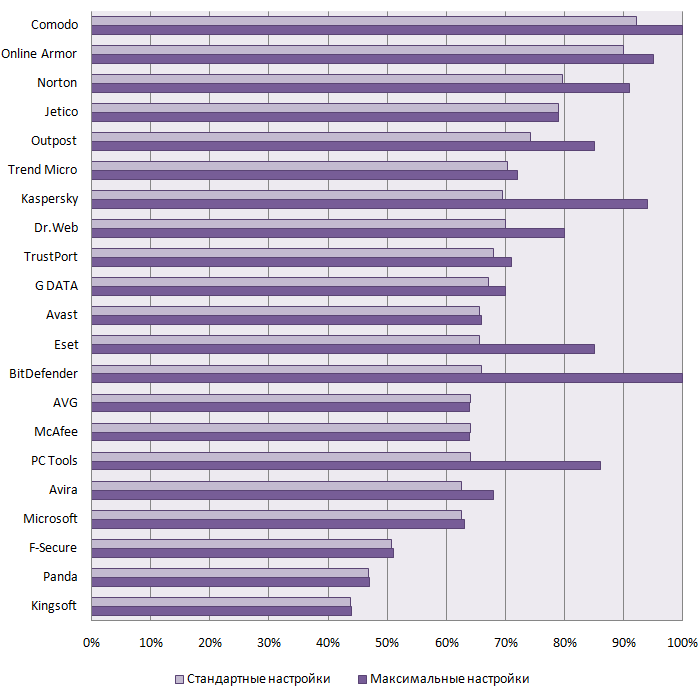 If an antivirus product’s self-protection blocked less than 40% of all attacks, the product failed the test.